The LOVE with which God loves HIMSELF IS the Holy Spirit! * The bond of unity between God the Father and God the Son is the Holy Spirit. The Holy Spirit is the “terminus” of the Infinite Love between the Father and the Son, a love God allowed to “spill over” into creation enabling us human beings to “become partakers of the Divine nature” (2 Peter 1:4). Amazing, but true! Thus, as St. Paul so beautifully tells us, “God’s love has been poured out into our hearts through the Holy Spirit, who has been given to us” (Romans 5:5). The essence of the spiritual life, in this regard, is a “take-over,” the takeover of our hearts by an Infinitely superior LIFE – the Holy Spirit. It is Mary Immaculate who most prominently exemplifies this “take-over” by the Holy Spirit. At her Annunciation the angel sent from Heaven greets Mary, not by her name, but by a title, saying, “Hail, Full of Grace.” [The Greek word used by Luke here], “kecharitomene, indicates that God has already graced Mary previous to this point, making her a vessel who ‘has been’ and ‘is now’ filled with divine life” (Ignatius Catholic Study Bible). As the Catechism of the Catholic Church states, “In fact, in order for Mary to be able to give the free assent of her faith to the announcement of her vocation, it was necessary that she be wholly borne by God’s grace” (no. 490). 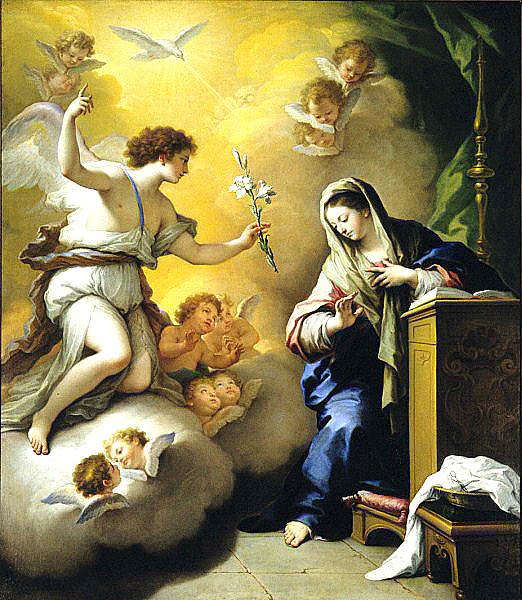 The sanctifying indwelling of the Holy Spirit was uniquely present to Mary Immaculate from the first moment of her life! And then during her Annunciation, probably while she was only a teenager, and after having given her consent, the “unspeakable” shadow of the Holy Spirit overshadowed Mary (Luke 1:45), and she became so possessed by the Holy Spirit, so fully divinized by His union with her, that a child, a Divine child, was conceived within her womb. Saint Luke then shows us that Mary is fully alive in the power of the Holy Spirit, for when Mary visits her cousin Elizabeth there is a veritable explosion of Holy Spirit power at the very sound of Mary’s voice! (see Luke 1:39-56). Everything in Mary’s life is taking place under the guidance and power of the Holy Spirit! “The sovereign Spirit who works in me, independently of myself has acquired so absolute a dominion over my spiritual and corporal being that it no longer depends on me to arouse in my heart any affection of joy or sorrow, save what He wills. Neither does my spirit give itself to any occupation save what He proposes.”(Saint Margaret Mary, Autobiography, V). References: *Blessed Abbot Marmion in Christ, The Life Of The Soul quotes Saint Thomas on page 17: “Therefore the Spirit who instills in us the love with which God loves Himself is called the Holy Spirit.” It is Father Faber who describes the Holy Spirit as the terminus of the inner life of the Trinity, and who also refers to the “unspeakable” shadow of the Holy Spirit. It is Rev. Kilian McGowan who refers to the spiritual life as a “take-over” by the Holy Spirit.